In college, no one likes dropping $50 on groceries every other week or so, but whether you live on- or off-campus, the grocery store is the first step to staying healthy and saving money. The key is to make sure you purchase food items you can use for multiple meals and things you can mix and mingle to create new meals. Below are tips you can use to get the most out of your grocery shopping experience and still leave the store with some money in your pocket. Create a shopping list and stick to it! – Making a list before you hit the store makes it easier to get in and out and not spend money on things you don’t need or that look good at the moment. Focus on key items you need and organize your list by the departments in the store (i.e – dairy, produce, meat, etc.). This will make it easier for you to make your way through each section of the store and get what you need in a timely manner. It might also help to plan out your meals for the week before you make your list, that way you know exactly what you need and it will reduce waste. Buy fresh food – The bulk of the money you spend should be spent on fresh food items. This is the easiest way to know you are buying something healthy. For college students, make sure you buy your fruits and vegetables a few days before they’re ripe. This will eliminate waste and give you a little bit more time to eat the food you purchased. Buying fresh food also forces you to eat at home since you don’t want to waste food and money. Another bonus to buying fresh is that produce aisles are usually located around the perimeter of the store which helps you avoid the unhealthy aisles. 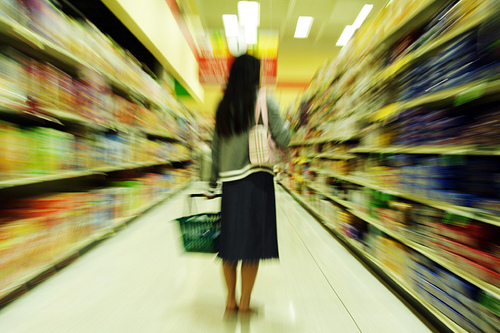 Shop with a full stomach – There is nothing worse then walking into the grocery store when you’re hungry. Everything looks good and everything is exactly what you have a taste for at that moment. Empty stomach’s make you veer off your list and buy unnecessary, and usually unhealthy, items. If you are forced to run to the grocery store after a full day of classes and don’t have time to eat a meal before, make sure to drink a full bottle of water or eat an apple on the way. Browse the frozen food aisle – Look for pre-made meals that have short ingredient lists and are low in sodium, calories and fat. Frozen vegetables last longer than their fresh alternatives and can easily be combined with other items to create different meals. Make sure to check the bag and make sure you are getting just the vegetables and they aren’t mixed with any sauces, seasonings or calories. You can do the same thing with frozen fruit, and it’s also a good snack! These simple changes are easy to make and can drastically improve your shopping trip and your diet. What grocery shopping tips to you use to stay healthy and save money? I went shopping without a list and hungry a couple weeks ago and spent more than $250. YIKES. (But I do have family of four.) My husband volunteered to go shopping next time. HA! These are very valuable tips when it comes to grocery shopping. Sometimes when I’m on a tight budget I like to bring a friend with me to the store, just to keep me on track and make sure I don’t spend all my money. Also- making a list for the whole week of what I am eating every night for dinner helps!